I don’t know what to make of this. Yet, it’s something I’ve seen often. From Liuzhou’s media, yesterday. Obviously, I don’t know where you are or come from, but, despicable as the Daily Mail and anything Murdoch breaths on are, there is no way the media in the UK would publish this. Yet in China, it’s OK.
Culture difference, I know, but it seems to me there is so little value on life here. This image obviously shows no respect to the deceased and must be upsetting for family and friends. On Tuesday afternoon, an unidentified 70-year-old woman was crossing a marked zebra crossing when she was hit by a truck and instantly killed. Now, I realise that it is probably very hypocritical of me to post the image, but I do so to make a point. It seems to me that a society which lauds a system selling vegetables on a trust basis and calling it an example of how much more civilised the city is becoming thanks to the efforts of the communist party, but shows no respect whatsoever for the dignity that the dead deserve and the compassion the mourners merit, has a very long way to go. By the way, the vegetables story was on page 2 and the dead woman story on page 6. Priorities. Self praising propaganda must come first.
. This entry was posted on Saturday, November 4th, 2017 at 2:51 pm	and is filed under Liuzhou News, Propaganda. You can follow any responses to this entry through the RSS 2.0 feed. Both comments and pings are currently closed. Something kept troubling me about this awful photo , apart from the obvious , but I couldn’t figure what . Something wasn’t right . It’s just come to me . Being hit by a truck sufficiently hard to cause death is an extremely violent event unlikely to only result in internal injuries . It’s almost certain there would have been catastrophic head injuries causing a massive bleed . I’ve seen quite a few . Hope I’m not obsessing but where’s the evidence ? With apologies to sensitive readers . 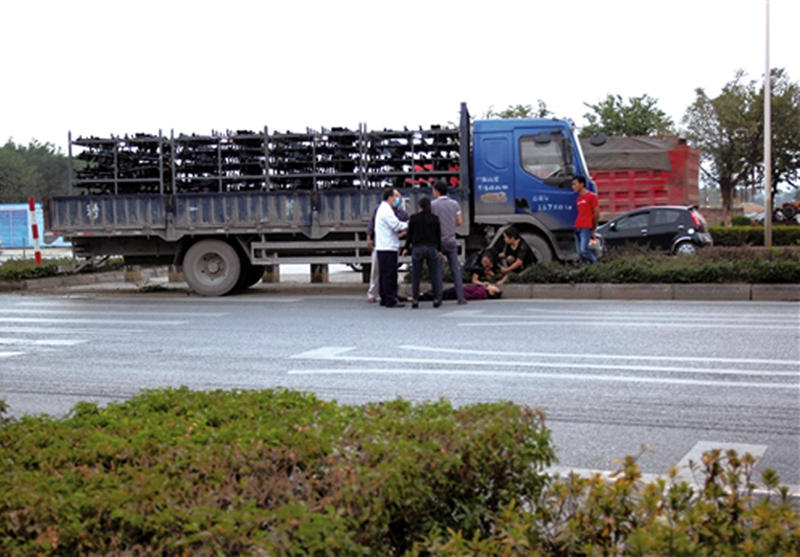 Your eyesight must be better than mine to be so sure there is no bleeding, but that said, I too have seen many people killed by trucks or buses in Liuzhou and elsewhere and there have often been only internal injuries. This isn’t the first example I’ve posted over the years. out of curtesy to her I desist from any further wrangling , but your main point is well made . Somewhat puzzling though because in person I’ve usually found Asians extremely caring and sensitive sometimes embarrassingly so.